Now they’re talking pre-nupts. Feb 8, 2017: Australian Army chief Lt Gen. Angus Campbell and Indonesia’s military chief General Gatot Nurmantyo kiss and make up over silly ‘Pancagila-Gate‘. On December 29, 2016, Indonesia’s Major-General Wuryanto suddenly tells Australia that military co-operation had been temporarily halted for “technical reasons.” That’s the official line anyway. Australia’s Defence Minister Marise Payne then confirmed specifically that the Indonesian military had unilaterally raised concerns with her about some Australian “teaching materials and remarks” at the Australian Army’s SAS barracks in Swanbourne in Perth on December 8, 2016 that were reportedly witnessed by an Indonesian there to provide language training, which apparently caused offence. Reuters reported that spokesman Johan Budi for Indonesian President Joko Widodo said there had been no discussion of the suspension by the Indonesian military with the president and the issue had been exaggerated. So for starters, we have Australia’s elite SAS told to invite a foreign force inside their barracks for training? One that has form as an ongoing enemy combatant of Australia known for atrocities and genocide against its own people and in neighbouring Timor Leste and West Papua? The Australian Government invites an Indonesian Army language lecturer to the SAS base to teach our troops Bahasa Indonesia? So one of the invited guest trainers, from notorious Kopassus brutal hit squad no less, then takes personal 18C offence at “teaching materials and remarks” which happened to be privately displayed inside the secure SAS barracks? 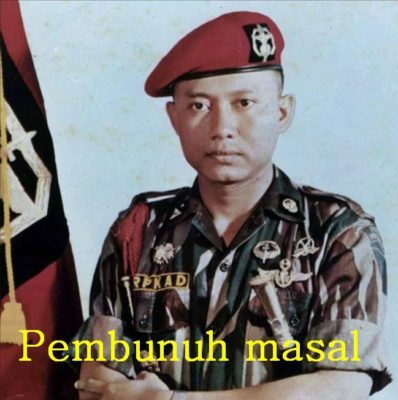 The Kopassus trainer heard offensive material in class including that the late Indonesian military leader Sarwo Edhie Wibowo was a mass murderer and that a TNI (Tentara Nasional Indonesia) police officer murdered his friend while drunk. Probably true. Kolonel Inf. Sarwo Edhie Wibowo played a key role in directing troops during the Indonesian killings of 1965–66, in which more than a million Indonesian civilians died. This Indonesian language trainer personally considers the material to be ridiculing the Indonesian military? So then he goes complaining to Kopassus who go crying to hypersensitive General Gatot Nurmantyo. What was this trainer wandering around the barracks with his smartphone taking photos and notes as well? What material is hanging on the walls of Kopassus barracks in Cijantung in East Jakarta? 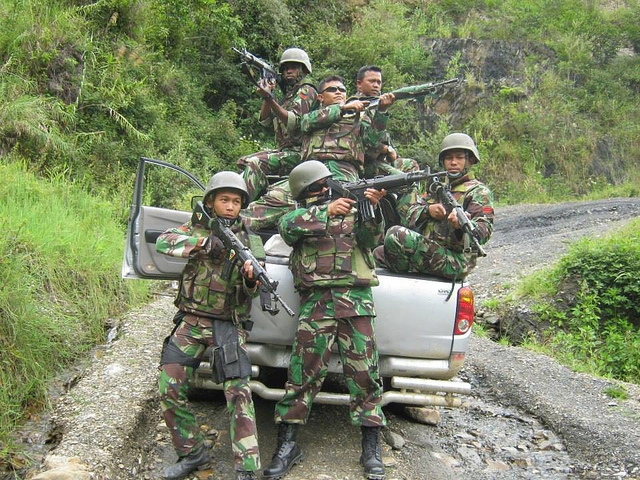 Photos of slain West Papuans at the hands of Kopassus thugs? Does our SAS get to wander through Kopassus barracks? 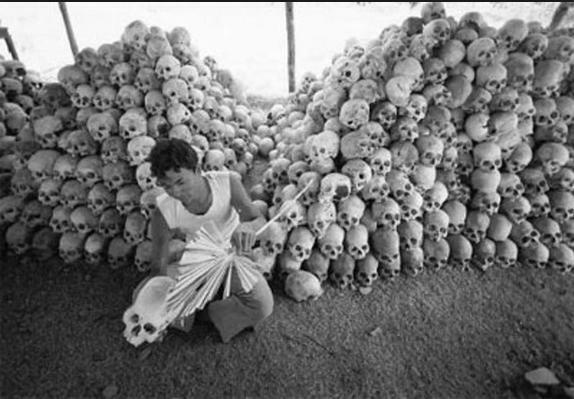 So did the trainer find laminated prints on display of Indonesian military atrocities from Suharto’s 1965 coup and massacre? 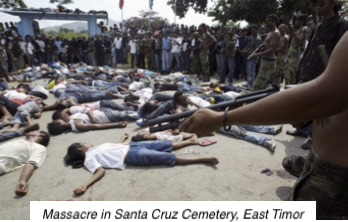 So did the trainer find laminated prints on display of Indonesian military atrocities in Dili and East Timor in 1991? 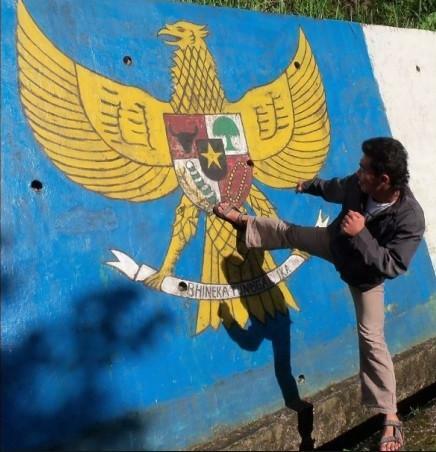 So did the trainer find laminated prints on display of Indonesian military atrocities inflicted on West Papuans by Kopassus and Tentara Nasional Indonesia (TNI) Battalion 753 like these? Hey, it’s an Australian Army barracks; nothing like a bit of truth to remind our troops about what they are up against with the Indonesian military junta. Such material is indeed scholarly critical assessments of the Indonesian military’s past and current behaviour. 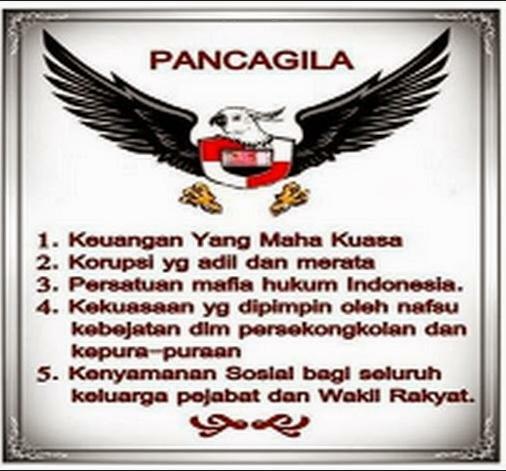 ‘Pancagila‘ is Indonesian for ‘Crazy Five’ being a spoof of Indonesia’s national emblem and five foundation principles that define the Indonesia nation, collectively termed ‘Garuda Pancasila‘. The ‘garuda’ being the mythical eagle derived from Indonesia’s ancient Hindu-Buddhist combined religions, representing an almighty disciple of the cosmic order. Something along those lines. Social justice for the whole of the people of Indonesia. Social comfort for the whole family Officials and Representatives. Well, the two version are similar. But while the official one is just propaganda crap concocted by military dictator Sukarno who commissioned Sultan Hamid II to design it for him back in 1950; the second one is closer to the truth of what really goes on in Indonesia’s zone of influence. Collusion, corruption and nepotism continue to influence the process of law enforcement in Indonesia. 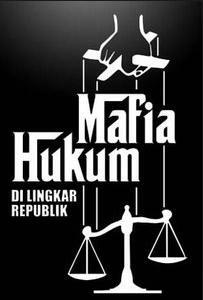 Indonesia’s military dictatorship and its military murderers deserve exposure and criminal trial. They themselves make a mockery of Indonesia’s state ideology and the five crazy principles conjured up by Sukarno after colonial rule. 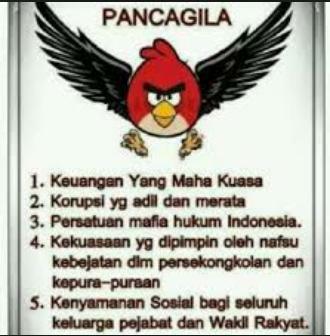 The Pancagila spoof was copied anyway from the Facebook page of an Indonesian student activist in Jakarta, Sahat Safiih Gurning, who used a rooster head instead. The Aussies must have just replaced it with a cocky head for a bit of downunder flavour. The original creative source of the Pacagila spoof, Sahat Safiih Gurning, was handed trumped up political charges in Jakarta in April 2016, after Sahat posted his version on his Facebook page. Sahat was arrested by police on Tuesday April 12 and threatened with five years in prison or a fine of Rp 500 million. He was charged with violating Article 68 of Law No. 24 of 2009 on the Flag, Language, and the State Emblem and the national anthem junto letter of Article 154 of the Criminal Code. But the judge saw the pun and sensibly threw the case out, citing freedom of speech rights. The over-reaction by the trainer simply revealed guilt. 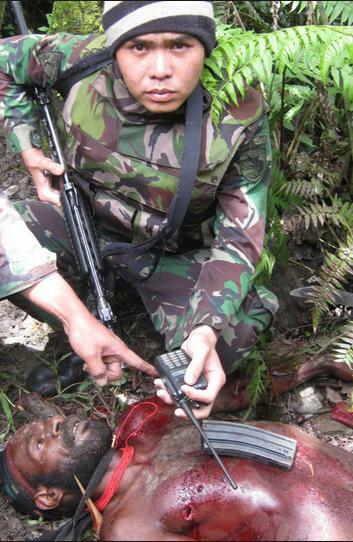 Any calls for “investigation” need to be done into the past and current crimes committed by the Indonesian military. But instead, Indonesian General Gatot Nurmantyo unilaterally does a dummy spit, instructing all military co-operation, including training with the Australian Defence Force, be suspended. Not a bad thing, frankly. But what does Australia do? Apologizes. Australian Army chief Angus Campbell has since conveyed “deep regret and apology” over the incident that occurred at the language training institution of the Special Forces Command of the Australian Army. 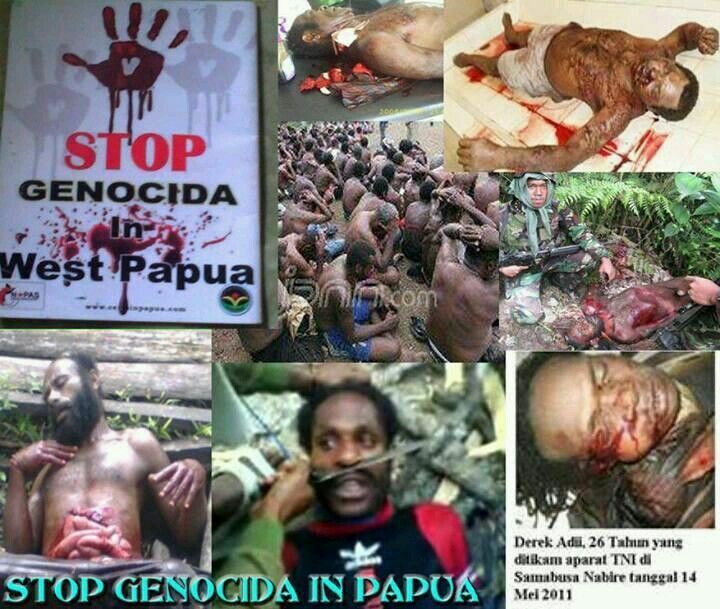 West Papua remains part of Melanesia, therefore it should be its own country. These dudes are really scary when they put sunglasses on.